Francois, Very nice looking sedan. 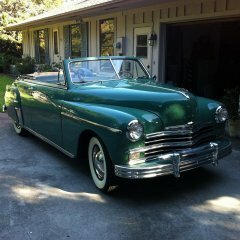 If your car is the Canadian model the Dodges here used Plymouth engines. 1940 probably the 218 if your car has the the original engine the serial number will start with D16... it is stamped on the block top left beside the oil filler. Ignition parts can be brought in by Carquest and Napa take the model and make of your distributor(maybe an Autolight made in Sarnia) Find the model tagged on you carb if you need rebuilt parts. Great! I was there last year with my '38 clutch. trying miniscule changes, trying to get the clutch to align, thinking it will never go (wasting a lot of time). Engaged the clutch and not long after she just slid in. My Dodge has been converted to 12 volts. I use the fog bulbs for turn signals and installed switched LED round angel eyes inside the fogs to use as daytimer running lights. On my '38 Dodge I used period reproduction amber fog lights for my front turn signals. 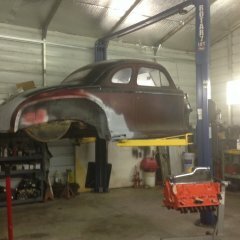 My chrysler is getting a sister! Before you spend to much on the new car see if you can register it in your name. If not, it is just lawn art or a parts vehicle. The buyers package will list the current owner and their community. Service Ontario will only issue a replacement registration to that person or their survivors with proper documentation. If the car has not been registered on the road since computor records, maybe your great uncle willed it to you. There are a bunch of Chrysler master tech videos on Youtube that might be of assistance. Here is one but there are other training videos on the transmission issues. If your car has the Canadian engine and want premade you will have to look for the long block dual intake. Any units manufactured for the Chrysler blocks should work. I believe the owners manuals of these era semi automatics instructed drivers from stationary to; put foot on the brake, engage clutch and select required gear reverse , low or high range. Let out clutch in gear while still engaging brake, release brake and accelerate as required. As stated engaging clutch is only required when moving gear selector. 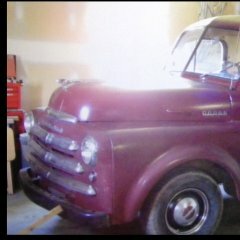 I have been looking for a prewar truck for a while now. I have come across an 1938 that is a couple of hours away. I'm waiting for some decent weather before arranging a viewing.The truck looks like its not in bad shape and mostly all there. The "but" is that a previous owner braised all the fenders, cowl and running boards. Being in eastern Canada, rust is an issue, so the probably 30 year old previous restoration is due for a redo. I would prefer a frame off restoration, but body parts for the 36-38 model, I imagine are quite rare. My fabrication skills leave much to be desired and will leave me in debit, for years, to friends who know what they are doing. Back of my mind says run far away, fast. But it sure would be nice to match 1938 Dodge sedan. Thoughts?